CUSTOMER OEConnection provides high-quality technology solutions to automakers and their franchised dealers to facilitate the sale of Original Equipment (OE) replacement parts. INDUSTRY Automotive CHALLENGE OEC spent a lot of time generating leads, but got marginal results from their investment. They needed to spend more time on qualified leads to maximize opportunities, without increasing headcount. WHY CONVERSICA • Follows up with every lead received from outbound marketing campaigns • Communicates with leads until they opt out or indicate interest • Integrates with all major CRM and marketing automation tools, including Microsoft Dynamics and HubSpot CUSTOMER SUCCESS STORY " Rachel is killing it today. I can't keep up with all the leads I am getting! " THE CONVERSICA SOLUTION The AI Assistant continuously works leads in the pipeline, sending an average of 12 messages per lead to achieve successful engagement. RESULTS Conversica is the leader in conversational AI for business and the only provider of AI-driven lead engagement software for marketing and sales organizations. The flagship Conversica® AI Sales Assistant helps companies find and secure customers more quickly and efficiently by automatically contacting, engaging, and following up with leads via natural, multi-channel, two-way conversations. Used by more than 1,200 companies worldwide, Conversica's sales assistants are built on a proven AI platform integrating natural language processing (NLP), natural language generation (NLG), and machine learning (ML) capabilities. leads messaged messages sent 34K 7,300 + engagement rate 33% Learn more at conversica.com ABOUT CONVERSICA " Our AI Assistant, Rachel, generates enough lead activity to eliminate the need for more headcount. She does the work of 2 ½ people. " 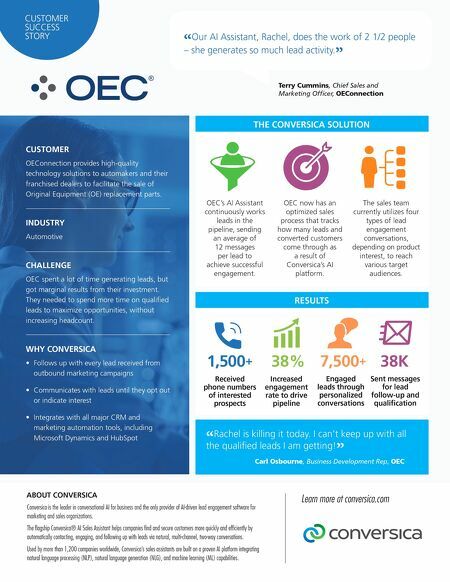 Terry Cummins, Chief Sales and Marketing Officer, OEConnection Carl Osbourne, Business Development Rep, OEC phone numbers received 1300 + OEC now has an optimized sales process that tracks how many leads and converted customers come through as a result of Conversica's AI platform. The sales team currently utilizes four types of lead engagement conversations, depending on product interest, to reach various target audiences.